Syrian activists say at least 11 people suffered chlorine gas poisoning during attack in Idlib province. Syrian activists said on Sunday that civilians have suffered chlorine gas poisoning during an attack on the rebel-held town of Saraqeb in Idlib province, The Associated Press reported. 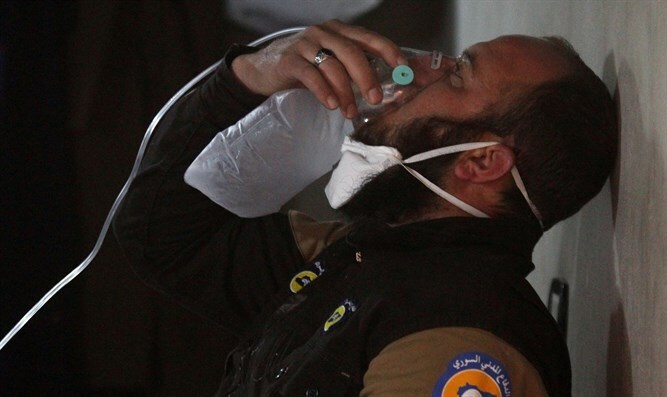 The Syrian Civil Defense search-and-rescue group said that three of its rescuers and six others were injured by chlorine gas in Saraqeb, a rebel-held town less than 16 kilometers (10 miles) from the front line with government forces. The Syrian American Medical Society said its hospitals in the area treated 11 patients for chlorine gas poisoning, according to AP. Reports of the latest chemical weapons attack comes days after the Trump administration accused Syrian President Bashar Al-Assad's government of producing and using "new kinds of weapons" to deliver deadly chemicals, despite committing to abolish its chemical weapons program in 2013. American officials emphasized on Thursday that the United States was seeking a new way to hold chemical weapons-users accountable and wanted cooperation from Russia, Assad's patron, in pressuring him to end the attacks. Raising the alarm about the continued threat of the chemical weapons, U.S. officials said it was "highly likely" that Assad kept a hidden stockpile of chemical weapons after 2013 that he failed to properly disclose. They said information gathered from recent alleged attacks also suggested that Assad retained a "continued production capacity" - also banned under the 2013 deal. The Organization for the Prohibition of Chemical Weapons (OPCW) has in the past determined that civilians in Syria may have been exposed to chemicals even after the Syrian government agreed to the 2013 deal, brokered by the U.S. and Russia, to surrender its chemical weapons. President Donald Trump has not ruled out additional military action to deter attacks or punish Assad over chemical weapons attacks, administration officials said, although they did not suggest any action was imminent. In April of 2017, Trump ordered an attack on a Syrian airbase after a chemical attack blamed on the Syrian regime in Khan Sheikhun. The Syrian regime denies having any connection to that attack and, in general, to any chemical weapons attacks that have occurred in Syria since the start of the civil war there.